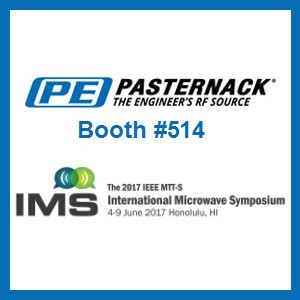 Irvine, California - Pasternack, a leading provider of RF, microwave and millimeter wave products, has announced that they will be exhibiting at this year's IEEE International Microwave Symposium (IMS 2017) in Honolulu, Hawaii from June 4th to June 9th at the Hawaii Convention Center. This year at IMS 2017, Pasternack's team of engineers will be in booth #514 promoting hundreds of newly released products. Since the 2016 exhibition, the company greatly expanded its portfolio of waveguide products including waveguide direct read attenuators, waveguide directional couplers, waveguide bends, transitions and much more. Additionally, Pasternack will be exhibiting new active components including USB controlled PLL synthesizers, high-power GaN amplifiers, active frequency multipliers, analog phase shifters, mixers, oscillators and the recently introduced 2.4 GHz radar demonstration kit, an innovative tool that can be used to determine the range of objects, and to study the principles of microwave radar object detection and motion detection. In addition to new products, Pasternack will be performing live demonstrations of their Cable Creator™ which allows customers to quickly design and order over 250,000 possible cable assembly configurations, all from an easy-to-use online interface. This innovative web-based tool provides users instant pricing, detailed datasheets and online ordering with same day shipping on any cable assembly built from an inventory of 1,300 connectors and 120 cable types. While at the Pasternack booth, attendees will also be able to pick up product literature on the industry's largest offering of in-stock amplifiers, switches, waveguides, test and measurement products, oscillators and synthesizers, mixers, multipliers and dividers, and 60 GHz products. Product managers at the booth can also discuss upcoming product releases scheduled later this year. "IMS is the industry's annual gathering place and event that provides attendees the opportunity to learn about today's products and technologies as well as give a first-hand view of the future trends in the RF and microwave industry," explains Shaun Gameroz, Senior Marketing Manager at Pasternack. "Exhibiting at IMS every year allows us to hear directly from our customers, to learn about the challenges they face at the systems and component level in an effort to try and solve their product requirements." To learn more about Pasternack and their participation at IMS 2017, please visit https://www.pasternack.com/pages/RF-Microwave-and-Millimeter-Wave-Products/IMS-2017.html.